Jo Simpson is one cool chick. Monster Energy Girl, Firebreather, Ink’d girl, dog lover and Batman fangirl… add into the mix incredible looks, what is there not to like about her. I eventually got to meet her in June 2015 for this shoot and it turned out awesome. Follow Jo on Instagram and Twitter to keep up with her antics. Any questions or comments on the shots, you can ask me below. Behind the scenes on a recent shoot…. @luluallure looking after her bestie! Greici Rosa is a Brazilian fun-loving rock chick who booked a shoot a few months ago. Greici loves her piercings and tattoos, which you can see from the pictures. She had just finished off her latest tattoo and wanted to do a shoot with her new leg ink….. which looked like it was painful to get done. I’m not sure if I could ever go down that route of piercing or tattoo. If her leg was painful, then the tattoo show below must have been agonising. It reads “Give me Love ….. Like never Before” , which is an interesting piece of text….read into that what you will. It was great working with Greici. She is a super confident person and comfortable in her body. Before she shoot we talked about all the ideas that she wanted to do for her shoot, some of which we managed to do and some we didn’t. It makes such a difference when you have a plan going into a shoot. I always try to have a good exchange of ideas with people before a shoot to make sure we are all on the same page etc. A lot of Greici’s ideas revolved around a music theme. We were not able to get a guitar for the shots she wanted, but she did have some drum sticks and a t-shirt of a band who she is friends with. 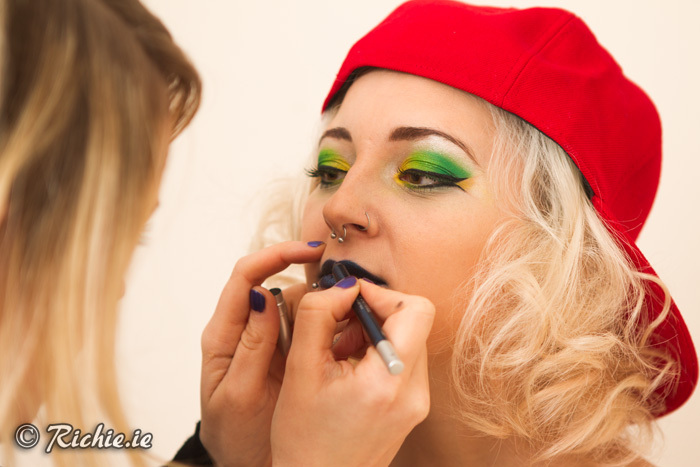 Hair and Make-up for this shoot was done by the lovely Julie Caulfield, check her out.